On a personal note, I had the good fortune to be in London in early November of 1955, and while visiting the Victoria and Albert Museum saw that a Memorial Exhibition of the work of Edward McKnight Kauffer was being held. The following images have just been scanned from the monograph I have saved since then. In 1955 I had illustrated brochures for a Boston agency for their American Airlines client, where his work was very well known and much appreciated by the agency art directors. I knew his style but nothing about the man, who was born in Montana, had worked in a San Francisco bookshop, washed dishes to pay his tuition to art school, traveled with a theatre company working as a scene painter, and eventually found himself in London (see below) where he eventually established himself as an extremely influential designer and illustrator. The Victoria and Albert published a book about McKnight Kauffer that is still available. He was the most celebrated graphic designer working in Britain in the twentieth century. He left America before World War I to travel in Europe and observe the work of Cubists and the famous German poster artist Ludwig Hohlwein. When war broke out, he settled in London as a painter, associatng with the London Group and the Vorticists. He worked at Roger Fry's Omega Workshops with Vanessa Bell and Duncan Grant, and in 1915 was commissioned by Frank Pick, then ad manager of the London Underground. 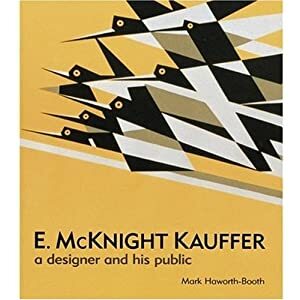 Thus began a client-designer relationship which continued throughout the 1920s and 1930s, ending when Kauffer returned to New York in 1940, where, unfortunately, he was not as successful as he had been in London. The introduction to the monograph, described above, included this paragraph by Ashley Havinden, O.B.E: ". . . Steeped in the best traditions of fine art, [Kauffer] considered the poster as an art form, in the belief that if a poster were not worth looking at it would fail to attract people's attention. If it were, people would remember it and the quality of the design would enhance the reputation of the company responsible for commissioning it. The regard in which the public holds the London Undergrund is surely due in no small measure to the outstanding series of posters for it by Kauffer under the aegis of the late Frank Pick."